« JAZZOO » is the result of an impressive collaboration with British illustrator Be n Javens . 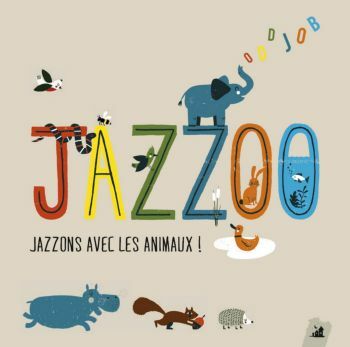 Originally conceived as a musical book for children to discover music and jazz, JAZZOO is a visual jazz concert featuring a delightful cartoon aimed at young and old alike, where a groovy, incredibly bubbly jazz combo creates a dialogue with the moving images to recount the adventures and misadventures of animals. 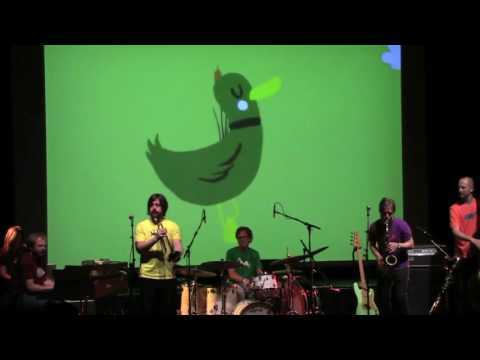 This unique performance, which is thouroughly enjoyable for parents as well, is an interactive experience where animations of the animals are projected on a screen behind the band. It’s a playful, exciting, and imaginative journey where neither the musicians, the children, nor the animals know how it's going to end. Will the porcupine make it across the road? And will the little fish be eaten by the big shark? The Oddjob five-piece band is a perfect example of the energy and high quality of the current Scandinavian scene. The previous 9 albums were critically acclaimed by both the Swedish and international press and were all nominated for Grammy Awards in Sweden, winning the prize three times. their eponymous album Oddjob (2002), Jazzoo (2014) which won best childrens album of the year 2013 and Folk (2016), best album of the year 2015. Their album "Clint" was named jazzalbum of the year in 2010 by the Sunday Times. « JAZZOO » Is a show that attracts not only the youngest: the audience into the bright, dreamlike world of the music of the 70s with its sense of musical adventure and unbelievably delicious range of tones and rhythms. Following its success, « JAZZOO 2 » with new animals is in preparation for autumn 2018, on stage and audio-book too.